Zap Pack - 3" x 4"
Instant re-usable heat wherever you go, whatever you do - around the house, in your car, at the office or on the go. 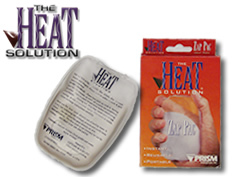 The Heat Solution® patented technology eliminates the need for electrical cords; just safe moist heat on command. 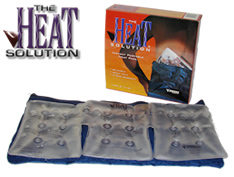 The Heat Solution® pack will conform to any area of the body where you need warmth and relief. Provides soothing heat up to 130°F in just 5 seconds and lasts for up to 30 minutes. Portability makes the this the excellent choice for instant heat at home or on the go. The Heat Solution® was designed with the active person in mind. It's ideal for providing therapeutic heat to treat sports injuries, sore muscles or sinus aches. THS 410 - 4" x 10"
THS 818 - 8" x 18"